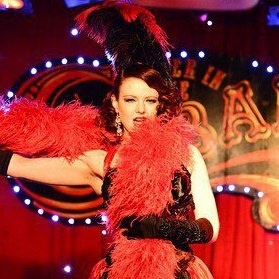 Scarlett, The Red Beauty, exploded onto the London Cabaret scene over a year ago creating interesting innovative acts that have been meticulously crafted to beguile the audience with humor and surprise. This enchanting goddess has taken thoughtful consideration for the golden era of burlesques classic bump and grind and is provocative and seductive beyond all measures. She has also been described as ‘The Red Headed Rascal’ for her innocent cheek and old fashioned humor which combined with her magnetic desire sets her apart from others on the burlesque scene. Scarlett is not only an enthralling professionally trained dancer but has the voice of a Swarovski spangled song bird. Whether performing on a stage the size of a postage stamp or in the Royal Albert Hall this siren radiates charm and has dazzling stage presence. Her flirtatious nature and fantastic hour glass curves tease, tempt and tantalize men and women alike spreading ‘Scarlett Fever’ all over the globe. Scarlett will never disappoint and is an absolute asset to any function or event. Scarlett performs for 4-6 minutes. PA with microphone and microphone stand.